Yellow Crocus, the debut novel by Laila Ibrahim was a total revelation to me. I had never before read a novel based on slavery in America and as I read the present novel set in the early 19th Century, strange customs and brazen brutality of slaveholders jolted me. Though, thankfully Yellow Crocus is not a depressing tale on the evils of slavery, but is a true portrayal of a special relationship shared between a wet nurse Mattie and her charge Elizabeth. The slave Mattie is forced to abandon her three month old son to breastfeed her mistress’ newborn daughter. Like any mother, she loathes to leave her son, but since she is a bonded labor, she could hardly object. And, as Mattie becomes responsible for delicate Elizabeth, her maternal instincts take over and she begins to love her as her own daughter. The writer portrayed the closed slaveholders community very convincingly. On one hand, the Wainwright family hardly allowed slaves to feel like human and on the other hand, their own kids were totally dependent on the whims and fancies of these very bonded people. I struggled to stop my tears when infant Elizabeth falls ill on being separated from Mattie and I could hardly suppress my laughter when little ‘lisbeth’ looked upon her own grandmother and mother as strange patrons and snuggled to Mattie to draw solace. What an irony that a slave, who was refused the status of a human being and was treated as a piece of property, was actually the fount of motherly affection, every kid aspires for! Had Laila continued with this motherly tale of self effacing Mattie, I would have still liked it, but the writer introduced a great twist in the middle and toppled the story on its head as Elizabeth grows up as a fine young lady and Mattie is relegated as a field hand. Will their changed circumstances affect their relationship as well, with Elizabeth fitting into the role of yet another indifferent slaveholder or will this story end on a different note? So many questions hit me as I read Yellow Crocus at a frantic pace to satisfy my curiosity and gasped at the subtle symbolism and in-your-face irony. The very title is one of the most powerful metaphor I have ever come across in a book. The crocus is a flower that heralds spring. It first made an appearance as Mattie’s nostalgic childhood memory, as yellow crocus was her mother’s favorite flower. But, ironically she was separated from her mother in the very spring. And from thereon every good or bad event began with the onset of spring, announced by the blossoming of a yellow crocus. Be it the beginning of Samuel’s education, separation and subsequent get together with Mattie, first rushes of love in Elizabeth’s life or her final meeting with her wet nurse, at each point yellow crocus made an appearance to mark the sweetness or bitterness of the event. But this symbolism wouldn’t have been so poignant without the accompaniment of her sibling irony. The novel is rich in irony of fate as well as situations. Mattie, a nursing mother is forced to abandon her own infant son to feed another newborn. Initially, she is in half mind to kill her charge, but later she falls in love with her. Ironically, her son lives just a few meters away, but Mattie can only look at him through a glass window, while Elizabeth who is always near her, is beyond Mattie’s reach as the invisible glass of status separates them. Mattie is responsible for the well being of Elizabeth and she does her duty so diligently that little lisbeth is more fond of her nurse than her mother, and yet Mattie is never given a chance to protect her family. Even her urgent pleas to sell Samuel to his father’s farm fall on deaf ears, and yet it is she who saves Elizabeth from the cruel jaws of death. Even the time period of 1840s were ironically transient. On one hand, there were rich slaveholders who considered slaves as properties, ruthlessly selling them, not even allowing them the dignity to get married while they themselves used bonded women to satisfy their lust and filled their coffers and home with mulatto children. On the other hand, there were staunch abolitionists who were ready to give up their profits to follow the diktat of their conscious souls. I was also stunned to know the bigotry of legislation. The slaves were declared as property because they were not Christians and thus lesser souls who have no right to dignity and freedom and yet throughout the novel, it was the slave Mattie who behaved like a pious soul, chanting the name of her God every night, accepting Elizabeth wholeheartedly and even saving her life. More than anything, I loved the novel for its scathing realism. In the prologue itself, Elizabeth declares that she is going to narrate the true story of her wet nurse and throughout the novel, she remains true to her word, telling the story as she saw it happening with the curious eyes of a sensitive toddler. The nervous Mattie of initial chapters, who wondered at the reflecting mirror and looked upon the clock as something of a magic, also grew with little Lisbeth in terms of love as well as boldness. In between, Laila also gave a colorful description of Elizabeth’s teenage years when she is being groomed to woo a suitable gentleman. Those glimpses into the living room and behind the veil scenes of Southern State of America was a tasteful exhibition of Victorian society where a lady may be presented as graceful wife but is actually little better than ornamented brooch worn and thrown by men at whim. And the episode where Elizabeth becomes aware of this painful reality and her actual relation with the mulatto slave Emile, was very well written by Laila. Finally, I loved the realistic streak in the end. Had Mattie and Elizabeth continued their special bond, the story would have seemed a fantasy as in those times even free slaves were not accepted in the society leave alone hobnobbing with the fugitive ones. So, the mutual cold acceptance of their respective fates came across as quite real. Last but not the least, despite being based on one of the cruelest tradition, the novel had some light moments and ends on a positive note, giving hope to all. 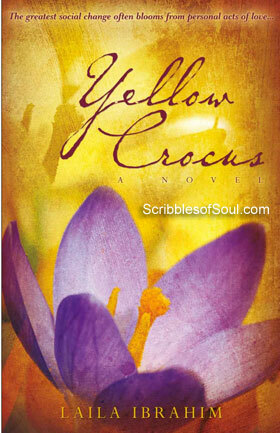 Yellow Crocus is a true portrayal of slaveholders’ ruthlessness and the eternal zeal of man to attain freedom. Kudos to Laila Ibrahim for a balanced yet touching fictional tale.